Is your once cute, cuddly, and well-behaved pup suddenly acting out? Is your dog ignoring you, taking off if he sees something interesting, and chewing on everything in sight? Did his once perfect “sit,” “down,” “stay” and “come” seemly disappear overnight? Are his friendly, social ways being replaced with rowdy, over-the-top greetings? Is he sometimes cautious or even suspicious? Does he occasionally look at you as if he hardly knows you? If your dog is between 6 and 18 months old, he is in the adolescent phase of life—that stage where the body looks full-grown but the brain is still developing. Many of the so-called problem behaviors, such as chewing, over excitement, and distractibility, are a result of normal physical and developmental changes. Along with the brain maturing, the adolescent body is also going through growth spurts, secondary teething, surging hormones, and fear periods. The teenage months are often a dreaded stage in a dog’s development, and it is a time many dogs are given up to shelters or rescues because they are destructive or out of control. But adolescence doesn’t have to be terrible. In fact, it can be an exciting and fun time. As with their human teenage counterparts, adolescent dogs can be energetic, playful, full of curiosity, enthusiastic about learning, and ready for just about anything. These five tips will help you not only survive your dog’s adolescence, but help you both thrive as you travel through this challenging age. 1. Exercise, exercise, exercise. Adolescent dogs seem to have unending energy and stamina. This is a time in life where even an hour-long on-leash walk may not take the edge off of your dog’s energy. Leash walks often need to be supplemented with dog-to-dog play, great games of chase, swimming, and opportunities to run and explore new areas. The more physical and mental exercise you can give your adolescent dog, the better. However adolescent dogs need down time too. Quiet rest for a portion of the day can help keep stress hormones from soaring too high (which can contribute to over excitement). Balancing rest, physical activity, and mental activity will help your dog behave his best. Also, remember that adolescent bodies are still growing and that joints are not fully developed. To reduce the risk of injury, wait until your dog is over a year before you start repetitive joint-straining activities such as agility, Frisbee, or long distance running. 2. Create positive social outlets. During adolescence, it is imperative that you continue providing positive social experiences with both people and other dogs. To keep up social skills with people, take regular walks in your neighborhood or other areas where you will see people. Invite friends to your house so your dog will continue to understand that people are welcome into your home. Practice “four on the floor” or “sit to greet,” and then when people come over use a leash to manage your dog’s jumping and treats to reward appropriate interactions. For socializing with dogs, identify your dog’s favorite playmates and arrange times for romps and rowdy play. In addition, walk in areas where your dog will see other dogs. For on-leash walks, be sure your youngster learns how NOT to say hi and to pass by other dogs politely. For the opportunity to meet and greet new dogs, try beaches and hiking paths where dogs are allowed off leash. Help your young dog learn to greet briefly and move on by reinforcing your dog for continuing with you on your walk. 3. Train! Often, previous training flies out the window when a dog reaches adolescence. When you say “sit” you dog may sniff the ground. When you say “come” your dog may act as if he doesn’t hear you. Your dog’s attention may be everywhere except on you. Try not to take it personally. 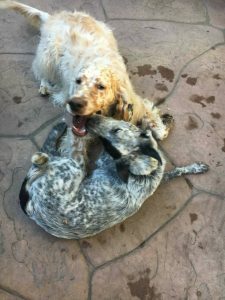 Developmentally, adolescent dogs (and teenagers) are learning about the world, their place in it, and their own limits. They may be less interested in you and more interested in friends and the environment. They are learning to think for themselves. At this age, continue to train (or get started training if you haven’t already). Make training fun and mix playtime and training time to keep young dog engaged. Practice in the real world where your dog can be successful. Gradually work towards more distracting environments. In addition, balance impulse control behaviors such as sit, down and stay with fun and expressive activities such as tricks. Reward your dog generously when he makes good choices on his own as well as when he follows your cues. Use not only treats and food as reinforcement, but also attention, games such as tugging, running together, and the opportunity to explore. Remember that your adolescent dog’s reliability may be hit and miss. Keep working with your dog, but also remember that he is still growing, developing, and learning. 4. Manage the environment. One of the most important pieces of surviving adolescence is managing your dog’s environment in such a way that he or she simply cannot get into a lot of trouble. Along with providing your dog with plenty of exciting chew opportunities, for example, limit your young dog’s ability to be destructive by confining him in a crate or puppy-proof area when he is not being supervised. Use a leash or long line if your dog is still learning to come, and let him off leash only in areas where he cannot get into trouble and where you can get him when his romp time is over. Expect that your young dog will not know how to handle the world. Make a plan to help your dog make the best choices. Leashes, long lines, crates, and baby gates can all help prevent the practicing of bad behavior. Remember that adolescent dogs often forget what they are supposed to do, or get so overexcited that they cannot do what they asked. Be ready to help them in those moments. 5. Enjoy your dog’s youth. Your dog’s adolescent energy, enthusiasm, and excitement can be contagious. Take the time to appreciate what your dog is experiencing and learning. But also remember that everything is not always easy for the adolescent dog. Other dogs and people are often annoyed with them. The world is sometimes overwhelming or even scary. Adolescent dogs don’t always know how to behave and that is stressful for them too. Celebrate your dog’s adolescent antics – his frequent invitations to play, zoomies through the garden, and his delight over the smallest things. Consider looking at the world through your adolescent dog’s eyes – explore with him, and try to enjoy where he may lead you. Adolescence is the time your dog is becoming an adult. It is also the time your relationship is growing, developing, cementing. Think past surviving your dog’s adolescence to thriving with him through and beyond this developmental period.